The Curriculum • Odds and ends for sale. Priced to move. Odds and ends for sale. Priced to move. Post subject: Odds and ends for sale. Priced to move. Hi all--I'm packing for a move and I'd like to sell off a few nice things that aren't haven't seen much (or any) wear. I am not planning on uploading pictures, but let me know if you have any questions or you really need to see anything and I will do my best to get you what you need. I want everything to sell by early Monday morning (say, 6am Monday) so I can ship on Monday afternoon when I go to the Post Office. Even though there are no photos, I'll give you the NK 100% money back guarantee on this stuff--I promise you're getting great deals at my asking prices here. If I don't forget, I'll post this over on the thrift exchange thread at some point this weekend--TC folks can have first dibs. 1. Brooks Brothers OCBDs in blue and blue uni stripe, regent fit, 16x34. Have been washed, but still have that crispy "new OCBD" texture. Each probably hasn't been worn more than 3x. Selling because I now prefer 33" sleeves. Asking $30 for both. 2. NWT Brooks Brothers Milano cords in "snuff suede" and two pairs of Bills khakis twills (from the epic sale) in M3 fit. One of the Bills is NWT, other has been worn once. Bills are factory hemmed (no cuffs). All three pairs are 36x30. Asking $45 for all three pairs of pants. 3. Lots of tweed jackets from trad brands (Paul Stuart, Brooks Brothers, Southwick, etc. ), mostly with 2b darted fronts (though there is at least one proper 3/2 brown herringbone tweed from Southwick). Size 40 short. $40 gets you two jackets. They won't be outdated looking. 4. Barbour Beaufort in sz. 40. I'm 85% sure it's black, but it could be navy. Older jacket, but with fresh wax. I know there's a little hole in it somewhere but I can't find it now that I'm actually looking for it. $50 shipped. 5. Made in USA burgundy Weejuns, size 8.5. Brand new/never worn. Not sure how old they are but they look great. $30. 6. Brooks Brothers Fitz cord jacket in a medium-wide wale. 40 short. Color is snuff suede (there's gotta be a "real" term for this color, but it's escaping me at the moment). 2 button darted. Front fastening button came off, so you'll have to sew it back. $30. 7. I have some nicer Italian sportcoats (Caruso, Attolini, Borrelli, etc.) if anyone's interested. Sizes are 50-52 with slightly shortened sleeves (24.5" range). Prices will be a little higher because I'm willing to hold onto them until I decide whether or not to keep them or sell them properly. If you're interested in any of that, PM me. These have been on the back burner since I discovered the Amazon.com house brand of sportcoats, of which the made-in-Italy ones are amazing--and super super cheap (that's probably a story for another day). 8. Orvis Battenkill garment bag. There's a sample of what these look like in the link below. Brand new/never used Orvis shoulder strap (I paid something like $25 for a new shoulder strap from Orvis after I bought the bag on eBay a few years back, and it's amazing to see how much the quality of modern Battenkill gear has gone down since the bag itself was manufactured). $75. Finally, if you're looking for anything specific, feel free to shoot me a PM to see if I happen to have it available. I joined Ask Andy's in 2005 and my hoarding behaviors have, at times, been a little out of control. Now that I'm moving, I'm planning on donating literally about a dozen large garbage bags worth of clothing on Monday. So feel free to shoot me a message to check and see if I happen to have something you might be looking for. Post subject: Re: Odds and ends for sale. Priced to move. Brooks Brothers OCBDs in blue and blue uni stripe, regent fit, 16x34. Have been washed, but still have that crispy "new OCBD" texture. Each probably hasn't been worn more than 3x. Selling because I now prefer 33" sleeves. Asking $30 for both. I'll take the shirts. PM sent. Damn good price on that battenkill bag. I paid more than that for one in worse condition without a shoulder strap. Have anything in my size or some ties to pass along K? Hah, If you were about six inches shorter, I could set you up! 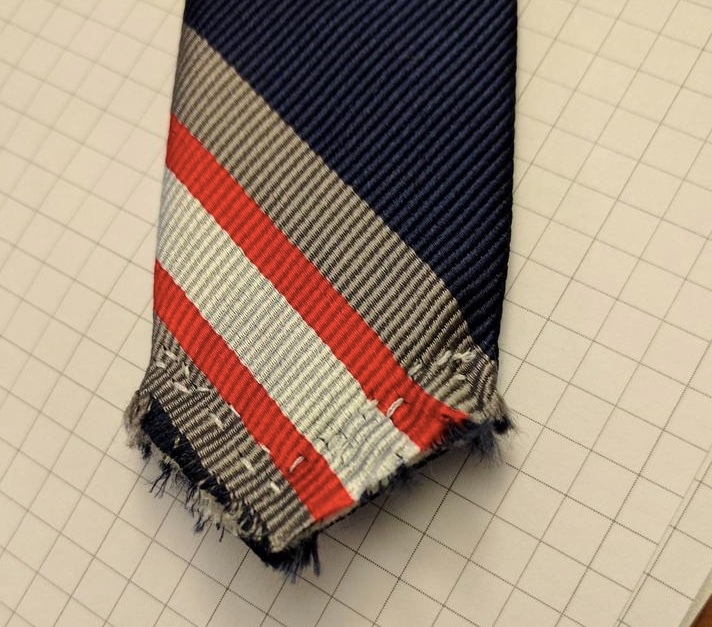 I'm about finished culling my ties, too, unfortunately. I started doing the "quick snip" that Paul Winston mentioned on Ask Andy's a while back and now I don't have any trouble with longer ones. It's feels a little weird to take a pair of scissors to a nice tie...and my sewing is horrible...but I am actually a big fan of this. Price on #2, 3, 4, 5, 6 dropped to $15 shipped CONUS. Let me know if you're interested. BTW, I have a few listings across the street. The MacCluer has been claimed, pending payment. Got the shirts today. Thanks for the bonus Charles Tyrwhitt blue spread collar, too!